A recent decision of the Massachusetts Appeals Court arguably expands the “mode of operation” approach, a theory by which a slip and fall plaintiff can hold a commercial property owner liable for damages. In Bowers v. P. Wile’s, Inc., 87 Mass. App. Ct. 362, 30 N.E.3d 847 (2015), the Court clarified that application of the mode of operation approach is not limited to cases where the dangerous condition causing the plaintiff’s accident resulted from breakage or spillage of items the defendant store is offering for sale. The traditional premises liability rule. Under traditional premises liability rules, where a foreign substance causes a plaintiff invitee’s slip and fall accident, the plaintiff can establish negligence on the part of the business owner in one of three ways: (1) by proving that the defendant caused the substance to be there; (2) by proving that the defendant had actual knowledge of the existence of the foreign substance; or (3) by proving that the foreign substance was present on the defendant’s premises for such a length of time that the defendant should have known about it. If, under (2) or (3), above, the owner knows or should know of the dangerous condition, then the plaintiff must also show that the owner should have expected that invitees would not discover the danger or protect themselves from it, and that the owner failed to exercise reasonable care to protect invitees from the danger. In Sheehan v. Roche Bros. Supermarkets, Inc., 448 Mass. 780 (2007), the Supreme Judicial Court adopted the so-called “mode of operation” approach, which focuses on whether the nature of the defendant’s business gives rise to a substantial risk of injury to customers. Under this approach, where a store owner’s chosen mode of operation makes it reasonably foreseeable that a dangerous condition will occur, a store owner can be held liable for injuries to a customer if the customer proves that the owner failed to take all reasonable precautions necessary to protect customers from these foreseeable dangerous conditions. The Sheehan Court held that the defendant supermarket’s use of a self-service mode of operation (in which customers select their items from the shelves rather than being waited on by store personnel) created the foreseeable risk that products would end up on the floor, posing a danger to customers who might be distracted by the store’s attractive displays of products. The plaintiff in Sheehan had slipped on a grape which had fallen to the floor in the self-service produce section of the store. According to the Sheehan Court, the mode of operation approach does not eliminate the requirement that the store owner knows or should know of the presence of the foreign substance on the floor prior to the accident. However, notice is presumed where the owner knows or should know that its very method of operation is likely to cause such dangers. The plaintiff is relieved of the burden of proving notice by, for example, showing how long the foreign substance has been on the floor. The plaintiff is still required to show that the accident was caused by a foreign substance or other dangerous condition and that the store failed to take reasonable measures, commensurate with the dangers of self-service, to make the store safe for patrons. The plaintiff must also show that the dangerous condition was caused by the self-service mode of operation and not by other causes (e.g. a fall caused by a newly waxed floor). The mode of operation approach could, theoretically, apply whenever a defendant’s method of doing business poses foreseeable dangers to customers. Indeed, the Sheehan Court made clear that the rationale supporting the mode of operation approach “was based on the foreseeable likelihood that hazards could result from the owner’s self-service mode of operation, and that such ‘ conditions may include, but are not limited to, spilled foreign substances or fallen matter.’” Bowers, 30 N.E.3d at 851, quoting Sheehan, 448 Mass. at 786 n.6. Nevertheless, until recently, the courts have applied the mode of operation approach only in cases where defendant businesses were self-service establishments similar to supermarkets and the hazard was caused by the breakage or spillage of items which the defendant store was offering for sale. The plaintiff in Bowers was a customer who fell after stepping on a small river stone which was on the sidewalk after it had been moved from an adjacent gravel area maintained by the defendant store. The sidewalk ran parallel to the store front and the gravel area was a strip, also parallel to the store front and located between the store and the sidewalk. Between the gravel area and the front wall of the store was a porch area. There was evidence that the store displayed merchandise on the porch and in the gravel area, and allowed customers to help themselves to products from those areas. In other words, the store operated on a self-service basis in those areas. It was a common occurrence for stones from the gravel area to be moved, by customer foot traffic or other causes, from the gravel area to the sidewalk. Store personnel were aware of this fact and, when outside the store for other reasons, would look for stones on the sidewalk and kick them back onto the gravel area. However, the store had no formal schedule for inspections of the sidewalk. We acknowledge that Sheehan, supra at 781, 863 N.E.2d 1276, itself, involved an injury caused by an item (a grape) that apparently fell from a self-service display to the supermarket floor before a customer slipped on it. However, under the rationale supporting the mode of operation approach, it should not matter whether the item that migrates from the self-service display to the floor (thereby causing a slipping hazard) is a grape or a quantity of shaved ice from the bed keeping the grapes cool. The distinction drawn by the motion judge between items offered for sale and other hazards foreseeably occurring as a result of the store’s use of a self-service mode of operation accordingly should make no difference in the applicability of the mode of operation approach. Moreover, as we have observed, the Supreme Judicial Court explicitly cautioned that its adoption of the mode of operation was not limited to “spilled foreign substances or fallen matter.” Sheehan, 448 Mass. at 786 n. 6, 863 N.E.2d 1276. Returning to the facts of the instant case, … it is undisputed that the gravel area, the source of the stone causing the plaintiff’s injury, was a self-service area used for the display and sale of store merchandise, including large items, the manipulation of which foreseeably could (and often did) cause stones to move onto the sidewalk, creating a risk of tripping or falling. In our view, it is accordingly an appropriate circumstance for application of the mode of operation approach. Bowers, 30 N.E.3d 847 at 852-53. Having concluded that the mode of operation approach applied, the Appeals Court noted that there remained a factual dispute as to whether, in light of the risks posed by its mode of operation, the store had failed to take reasonable steps to prevent the accident that occurred. It therefore reversed the summary judgment for the store and sent the case back to the trial court. The Bowers decision expands the reach of the mode of operation approach. By making clear that the dangerous condition leading to a plaintiff’s injury may be any condition foreseeably occurring as a result of the store’s use of a self-service mode of operation, and is not limited to the presence of store merchandise on the floor, the Bowers decision makes it easier for more plaintiffs to recover compensation. Suppose you gave Bill Gates $1,000 to help him start a small company in his garage. When that company turned out to be Microsoft, you would prefer that the money be treated as an equity investment, so that you could share in the increased value of the company, instead of a loan, in which case you would only be entitled to repayment of the $1,000 principal. On the other hand, imagine that you are a part owner of a company that is having cash flow problems. You provide money to help pay its debts but it later declares bankruptcy. In that case, you would prefer that your contribution be deemed a loan, because such loans are paid off in full before shareholders of a bankrupt company receive anything. The proper characterization of funds provided to corporations, as debt or equity, is a recurrent subject of litigation. Greensleeves, Inc. is an environmentally aware business specializing in the production of formal wear made entirely of plant foliage. Abe and Alice are short on money to start Greensleeves. Having failed to obtain loans from two banks, they approach Jackson Banana Plantations for help in funding the new company. Jackson agrees to do so, anticipating that Greensleeves would purchase a great number of its, until then, useless banana leaves. Without the money provided by Jackson, Greensleeves would not have been able to cover its operating expenses. It is agreed that Jackson would own 40% of the Greensleeves stock. However, because Jackson wants to conceal its involvement with Greensleeves, it is further agreed that the funding will be provided in the form of personal loans to Abe and Alice, evidenced by demand promissory notes. All stock will be held by Abe and Alice, but they agree, on demand, to transfer 40% of the stock to Jackson. Correspondence between the parties sometimes refers to the Jackson funding as loans, but at other times makes clear that the stock in Greensleeves being held by Abe and Alice is actually owned by Jackson. Jackson never demands payment of any of the notes and no payments are ever made. After a dispute between the parties, Greensleeves attempts to terminate its relationship with Jackson. Jackson demands transfer of the stock, but Greensleeves refuses to make the transfer. Letters from attorneys ensue. Jackson files suit demanding full repayment of all of the “loans” it had made to Greensleeves by the demand notes. Greensleeves responds that the so-called loans are, in fact, equity investments; and are nearly worthless as Greensleeves is close to insolvent, its banana leaf undergarments having failed to generate much consumer interest. The Court must decide whether the Jackson funding was debt or equity. “Whether an advance should be treated as a capital contribution to, rather than creating a debt of, the bankrupt depends to some extent on the objective intention of the contributor, and in part on whether, in particular circumstances, equitable considerations require treatment of the advance as a capital contribution.” Where a corporation is formed with initial capital that is grossly inadequate to the purposes of the corporation’s business, requiring immediate shareholder loans in order to operate, shareholders’ so-called debt should be treated as equity capital, and given no preference over creditors in the distribution of assets…. We think that where the loans are indeed a substitute for capital to the extent necessary to the operation of the business, they must be treated as capital and be subordinate to claims of creditors…. Here, … careful scrutiny … leaves no doubt that these loans from Basil and Robert were in effect capital contributions. Id. at 522-23. (Emphasis added, citation omitted, footnote references omitted). See also, Buchanan v. Warner, 2006 WL 4119791, *9 (Mass. Super. 11/8/06); TLP Leasing Programs, Inc. v. Northern Light Tech. LLC, 2005 WL 3605414, *1 (Mass. Super. 11/1/05); Garvey v. Lemle, 2005 WL 2009552, *8 (Mass. Super. 7/29/05); Milliken & Co. v. Duro Textiles, LLC, 2005 WL 1791562, *13 (Mass. Super. 6/10/05); American Twine Limited Partnership v. Whitten, 392 F.Supp.2d 13, 21-22 (D. Mass. 2005). The Court also found significant the lack of security for the loan. The “absence of security for the advances is a strong indication that the advances were capitalcontributions rather than loans.” According to the Court, “[a]lthough some loans are made ‘on signature,’ … the absence of provision for security in a loan of this scale is telltale that a ‘loan’ is not real, … and so, also, for the absence of meaningful enforcement mechanisms.” See also Kimberly-Clark Corp. v. Commissioner of Revenue, 83 Mass. App. Ct. 65 (2013) (the absence of default provisions and the failure of the “debtor” to make any payments on the “loan” supported the conclusion that funds advanced were capital contributions, not debt). Also relevant, according to the Court in Overnight, is whether a third party lender would have made the alleged loan. What is assumed here is a hypothetical independent lender willing to make a ten-year advance of $600 million in cash to Overnight without exacting security in specific assets of the company (at best the approximately $300 million). … Agreeing with the board, we think the hypothetical willing lender could not be found in the flesh. The point can also be made by asking whether anyone could be found to buy the existing note from Holding (or Union Pacific) and at what point in time and at what discount. 54 Mass. App. Ct. 189-90. (e) how the debt was treated in the business records. In re: Shamus LLC, 2008 WL 3191315, *12 (D. Mass. 8/6/08), quoting In re: Atlantic Rancher, Inc., 279 B.R. 411 (Bankr. D. Mass. 2002). See also American Twine, 392 F. Supp.2d at 22-23; In re: Felt Mfg. Co., Inc., 371 B.R. 589, 629-32 (D.N.H. 2007). These are the factors applied by federal courts in the First Circuit. These are: “(1) the names given to the certificates evidencing the indebtedness; (2) the presence or absence of a fixed maturity date; (3) the source of payments; (4) the right to enforce payment of principal and interest; (5) participation in management flowing as a result; (6) the status of the contribution in relation to regular corporate creditors; (7) the intent of the parties; (8) ‘thin’ or adequate capitalization; (9) identity of interest between creditor and stockholder; (10) source of interest payments; (11) the ability of the corporation to obtain loans from outside lending institutions; (12) the extent to which the advance was used to acquire capital assets; and (13) the failure of the debtor to repay on the due date or to seek a postponement. In re: Blevins Concession Supply Co., 213 B.R. 185, 187-88 (Bktcy. S.D. Fla. 1997). In our hypothetical, many relevant factors support a finding that the funds transferred from Jackson to Greensleeves were capital contributions or equity investments rather than loans. First, the funds were needed to initially capitalize Greensleeves, which would have been severely undercapitalized without the Jackson funds. As the Yankee Court said: “We think that where the loans are indeed a substitute for capital to the extent necessary to the operation of the business, they must be treated as capital.” 53 Mass. App. Ct. at 523. Second, Jackson took no security for the “debt”. This, in itself, is indicative of an equity investment as opposed to a loan. Overnight, 54 Mass. App. Ct. at 189. Third, because Greensleeves had little capital other than what Jackson had provided, and because Jackson took no security, repayment of Jackson’s advances was dependent upon the success of Greensleeves, again indicative of an equity investment. Overnight, 54 Mass. App. Ct. at 190. Jackson could not reasonably expect to be paid back regardless of the performance of Greensleeves. Fourth, the notes did not provide for a fixed maturity date and no payments were ever demanded by Jackson or made by Greensleeves. Fifth, there is no reason to believe that a third party lender would have made the same loan to Greensleeves. Two banks declined to extend credit. Jackson might claim that it was a third party lender, not an insider of Greensleeves, but Jackson funded Greensleeves in return for equity. It seems highly unlikely that a disinterested third party lender would have given Greensleeves, a penniless start-up company with a questionable product line, significant unsecured loans. Perhaps most importantly, the parties themselves treated the funds as an equity investment rather than a loan. Although Jackson at one time referred to the funding as personal loans, other correspondence between the parties shows that they believed Jackson had purchased a 40% equity interest in Greensleeves. Indeed, when Greensleeves refused to transfer the stock certificates to Jackson, Jackson threatened to sue. Certain other factors support the view that Jackson’s funding of Greensleeves was a loan transaction: (1) there is no evidence that Jackson exerted any management or control over Greensleeves; (2) the notes were executed; and (3) Jackson was not an insider of Greensleeves. To the extent that the Jackson funds were used for operating expenses rather than capital purchases (e.g. equipment), that would also support a finding that the funding was debt rather than equity. On balance, the factors support the conclusion that the alleged “loans” were actually equity investments or capital contributions. Thus, Greensleeves is likely to succeed in its defense of Jackson’s suit for payment of the notes. Whether funds provided to a business constitute debt or equity is often a difficult question requiring a detailed factual analysis. Parties entering into such funding transactions should take steps to make clear whether the source of the funds is making an investment or merely lending money. They should be aware, however, that the ultimate characterization of the funding depends not just on how the parties refer it, but also on the financial circumstances of the business, the terms of any alleged loan, the parties’ course of conduct, and many other factors. 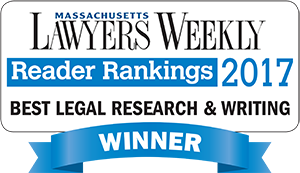 Statistics released by the Massachusetts Appeals Court confirm the conventional wisdom that appeals are difficult to win. In 2012, the latest year for which statistics are available, Appeals Court panels decided 1583 cases, split roughly evenly between civil and criminal matters. The Appeals Court affirmed the lower court in 653 of 833 decisions rendered in civil cases, or 78.4% of the time. It reversed in 112 cases (13.4%) and reached some other result in the remaining 68 cases (8.2%). The statistics also showed that the vast majority of civil cases appealed to the Appeals Court originate in the Superior Court Department of the Trial Court, and that more than four of every five appeals decided by the Appeals Court result in unreported, summary dispositions rather than published opinions. Despite the general rule that only final judgments are appealable, Massachusetts provides a statutory avenue by which litigants may seek to have a single justice of the Appeals Court review certain interlocutory orders entered in civil cases. Massachusetts G.L. c. 231, §118, ¶1, provides that a party aggrieved by an interlocutory order of the Superior Court, Housing Court, Land Court, Juvenile Court or Probate Court may file a petition with the “appropriate appellate court for relief from such order.” Such interlocutory petitions are governed by the statute and by Appeals Court’s “Standing Order Governing Petitions to the Single Justice Pursuant to G. L. C. 231, sec. 118 (First Paragraph) or Rule 12(a) of the Uniform Rules on Impoundment Procedure” (“Standing Order”). An interlocutory petition under G.L. c. 231, §118, ¶1, should be distinguished from an interlocutory appeal under G.L. c. 231, §118, ¶2, of an order granting, denying or modifying an injunction. An appeal under paragraph two is governed by the Massachusetts Rules of Appellate Procedure, and takes far longer than a paragraph one petition to the single justice. Notably, a litigant may proceed under both paragraphs concurrently. The single justice “enjoys broad discretion to deny the petition, or to ‘modify, annul or suspend the execution of the [trial court’s] interlocutory order,’ … or, finally, to report the request for relief to the appropriate appellate court.” Ashford v. Massachusetts Bay Transp. Auth., 421 Mass. 563, 566 (1995). However, the single justice may not take action which is determinative of a case, such as granting a motion to dismiss. See also Mass. R. App. P. 15(c). A petition for interlocutory review which seeks relief beyond the power of the single justice will be denied. Clair v. Clair, 464 Mass. 205, 214 (2013), quoting Caffyn v. Caffyn, 441 Mass. 487, 490 (2004). When the order relates to injunctive relief, however, the single justice may engage in a broader review. Boston Firefighters Union, IAFF, Local 718 v. WHDH TV, Channel 7, 2007 WL 4259762 (Mass. App. Ct. Oct. 5, 2007), quoting Hull Mun. Lighting Plant v. Massachusetts Mun. Wholesale Elec. Co., 399 Mass. 640, 642 (1987). A trial court’s legal conclusions, however, are subject to broad review and in those cases, the single justice may apply the de novo standard of review if the preliminary injunction order was predicated solely on documentary evidence. Boston Firefighters Union, 2007 WL 4259762, citing Packaging Indus. Group, Inc. v. Cheney, 380 Mass. 609, 615 (1980); Manfrates v. Lawrence Plaza Ltd. Partnership, 41 Mass. App. Ct. 409, 412, n. 4 (1996). The statute requires that a petition for interlocutory review of an order be filed “within thirty days of the entry of such order.” The period begins on the date the clerk actually entered the order on the trial court docket, not the date shown on the order. Moreover, because the deadline is imposed by statute rather than by court rule, it is jurisdictional, cannot be extended by the court and is not automatically extended by court rules which allow filing on the next business day if the period ends on a Saturday, Sunday or holiday. Accordingly, if the 30-day period ends on a weekend or holiday, the litigant should file the petition on the preceding business day. It should also be noted that the filing of a motion for reconsideration does not extend the time for filing a petition for interlocutory review and that interlocutory review usually cannot be obtained from the denial of a motion to reconsider. It is the date of the original order that determines the time period for filing. (1) a request for interlocutory review, which shall state briefly the nature of the order or action of the trial court from which review is sought, the entry date of such order or action, and the name of the judge who entered it; (2) a statement of the issues of law raised by the petition; (3) a statement as to whether a party has filed, served or intends to file a motion for reconsideration in the trial court; (4) a statement of the specific relief requested; and (5) an addendum containing a copy of the order or action of the trial court (a draft order for the single justice may be attached). See Standing Order. The petition must comply with Mass. R. App. P. 20(a)(1)-(3), which govern the format of appellate briefs. Id. More information about the requirements of Rule 20, and about appellate procedure in general, can be found here. Although the Standing order does not mention Rule 20(a)(4), which allows briefs to be printed on both sides of the page, the Appeals Court will accept double sided petitions. The petitioner may file a memorandum of law not exceeding 15 pages, “in support of the petitioner’s position, with citations to appropriate authorities and a statement addressing why interlocutory relief is appropriate.” See Standing Order. The memorandum is also required to comply with Rule 20. Id. In addition to the petition and memorandum, the petitioner must submit an appendix of relevant documents. Id. The memorandum should cite to the documents in the appendix. The Appendix must begin with a table of contents listing the documents it contains, and must include, “a current copy of the trial court docket entries and all relevant papers filed in the trial court, including those filed by the other party or parties….” Id. The Standing Order cautions that, “[o]nly those pleadings, exhibits, and papers which were before the trial court when the order appealed from was entered, and which are necessary for an adjudication of the issues raised, may be submitted.” Id. The opposing party may, but is not required to, file an opposition memorandum within seven days after the petition is filed (or 10 days if the petition was served by first class mail). Id. The single justice may, and often does, shorten the time for filing an opposition. An opposition memorandum should not exceed 15 pages, compliant with Rule 20, and should state the reasons why the single justice should not grant the petition. Id. A supplemental appendix may be filed if the petitioner’s appendix fails to include documents which the opposing party deems relevant. Id. The petition, supporting memorandum, appendix, opposition, any supplemental appendix, and certificates of service may be e-filed using the eFileMA system. If e-filed, no paper filing is required. in the alternative, a party may file paper copies with the Appeals Court and the trial court, and email electronic versions to the Appeals Court, as provided in the Standing Order. The filing fee in the Appeals Court was $315 as to December 2017. G. L. c. 262, §§ 4 & 4C. The single justice generally decides petitions for interlocutory review on the papers and without a hearing. If the petition is filed with respect to a discovery order and is denied, the single justice may, after such hearing as the single justice in his discretion deems appropriate, require the petitioning party or the attorney advising the petition or both of them to pay to the party who opposed the petition the reasonable expenses incurred in opposing the petition, including attorney’s fees, unless the court finds that the filing of the petition was substantially justified or that other circumstances make an award of expenses unjust. G.L. c. 231, §118, ¶1. In any case in which the trial court entered an order impounding, sealing, or excluding from public access all or any portion of the trial court records, or there is material or information in a party’s petition, addendum, opposition, or any appendix that is automatically impounded or deemed confidential by statute or court rule, the parties shall comply with Mass.R.A.P. 16(d), 16(m), and 18(g). The parties shall comply with Supreme Judicial Court Rule 1:24, Protection of Personal Identifying Information in Publicly Accessible Court Documents in all filings to the Appeals Court. When more than one claim for relief is presented in an action, whether as a claim, counterclaim, cross-claim, or third-party claim, or when multiple parties are involved, the court may direct the entry of a final judgment as to one or more but fewer than all of the claims or parties only upon an express determination that there is no just reason for delay and upon an express direction for the entry of judgment. In the absence of such determination and direction, any order or other form of decision however designated, which adjudicates fewer than all the claims or the rights and liabilities of fewer than all the parties shall not terminate the action as to any of the claims or parties, and the order or other form of decision is subject to revision at any time before the entry of judgment adjudicating all the claims and the rights and liabilities of all the parties. Due to the policy disfavoring piecemeal appeals, the exception offered by Rule 54(b) is quite narrow. For reasons of public policy and judicial administration, Rule 54(b) certification is granted only in extraordinary cases. When applying rule 54(b), both the trial court in the first instance and an appellate court on review must ever bear in mind the rule’s underlying purpose of balancing the need for immediate review, based on the likelihood of injustice or hardship to the parties of a delay in entering a final judgment as to part of the case, against the appellate courts’ “traditional abhorrence of piecemeal appellate review…. Because of the bedrock policy against premature and piecemeal appeals, the Supreme Judicial Court has declared that “[w]e do expect strict compliance” in dealing with the narrow exception to that policy created by rule 54(b)…. Consequently, certifications under rule 54(b) “should not be granted routinely or as a courtesy or accommodation to counsel.”… “[O]verly generous use of [rule] 54(b) … can create a minefield for litigants and appellate courts alike,” … and does not further “the interests of sound judicial administration.” …. Therefore, the court’s rule 54(b) discretion should be “exercised sparingly,” … and, when the dismissed and the surviving claims are factually and legally overlapping or closely related, such a fragmentation of the case is to be avoided except in “unusual and compelling circumstances.”…. Long v. Wickett, 50 Mass. App. Ct. 380, 387-89 (2000) (internal citations omitted). See also Morrissey v. New England Deaconess Association-Abundant Life Communities, Inc., 458 Mass. 580, 594-95 (2010) (“Rule 54(b) is directed toward efficient use of judicial resources, balancing the need for immediate review, based on the likelihood of injustice or hardship to the parties of a delay in entering a final judgment as to part of the case, against the appellate courts’ traditional abhorrence of piecemeal appellate review, … as a matter of sound judicial administration…. [T]he narrow exception to this policy created by rule 54(b) is exercised sparingly” (internal quotation marks omitted)); Johnson v. Cooke, 2004 WL 856606, *4 (Mass. Super. 3/1/04); Hull v. Foley, M.D., 2004 WL 65287, * 5 (Mass. Super. 1/15/04). (1) the action must involve multiple claims or multiple parties; (2) there must be a final adjudication as to at least one, but fewer than all, of the claims or parties; (3) there must be an express finding that there is no just reason for delaying the appeal until the remainder of the case is resolved; and (4) there must be an express direction of the entry of judgment. the facts of each case [must] be closely examined to ensure that allowing an appeal will not wrongly fragment the case…. A court should also examine whether [certification] will advance the interests of judicial administration and public policy. Id. at 396 n.12, quoting J.B.L. Constr. Co. v. Lincoln Homes Corp., 9 Mass. App. Ct. 250, 252-53 (1980). See also Signature Financial Group, Inc. v. Coolidge, 2003 WL 21246174, *2 (Mass. Super. 4/14/03). Where Rule 54(b) certification has been granted improperly, the Appeals Court can dismiss the appeal and restore the order appealed to its interlocutory status. Long, 50 Mass. App. Ct. at 404. The doctrine of present execution is one of the limited exceptions to the general rule that only final judgments are appealable. “As a general rule, an aggrieved litigant cannot as a matter of right pursue an immediate appeal from an interlocutory order unless a statute or rule authorizes it.” Shapiro v. City of Worcester, 464 Mass. 261, 264 (2013). The doctrine of present execution, however, provides that “an interlocutory order is immediately appealable if it concerns an issue that is collateral to the basic controversy … and the ruling will interfere with rights in a way that cannot be remedied on appeal from the final judgment.” Id. (internal citations and quotation marks omitted). For example, “[o]rders denying motions to dismiss based on immunity from suit fall into this limited class of cases because (1) such orders are always collateral to the rights asserted in the underlying action, … and (2) the right to immunity from suit would be lost forever if such orders were not appealable until the close of litigation.” Id. The doctrine of present execution also provides for interlocutory appeal of orders denying special motions to dismiss under the Massachusetts anti-SLAPP statute, G.L. c. 231, § 59H, Fabre v. Walton, 436 Mass. 517, 521 (2002), and orders disqualifying a litigants attorney. Slade v. Ormsby, 69 Mass. App. Ct. 542 (2007), among others. What Orders or Judgments are Appealable? Subject to limited exceptions, discussed below, a litigant can appeal only from a trial court order or judgment which is “final.” In civil cases, Massachusetts Rule of Civil Procedure 54(a) defines a “judgment” or “final judgment” as “the act of the trial court finally adjudicating the rights of the parties affected by the judgment….” Rule 54(b) makes clear that a judgment which “adjudicates fewer than all the claims or the rights and liabilities of fewer than all the parties” is interlocutory, not final, unless the trial court expressly directs the entry of final judgment on the claims decided, and certifies that “there is no just reason for delay.” The “finality requirement eliminates piecemeal appeals which cause delay and waste judicial resources.” Roche v. Boston Safe Deposit & Trust Co., 391 Mass. 785, 791 (1984). Under Rule 58, a judgment must be set forth as a separate document and becomes effective only when entered on the court docket. Thus, there is no appeal of right from the many orders entered by trial courts which do not dispose of all claims as to all parties. These include discovery orders, denials of motions for summary judgment, evidentiary orders and many others. The doctrine of present execution. The law regards a corporation as an entity with its own legal rights and responsibilities, separate from those of its shareholders, officers or directors. Yet, a corporation can act only through the conduct of its officers, directors and employees. Consequently, an issue often arises as to whether a corporate officer can be held individually liable for damages when he or she causes the corporation to fire an employee. As is often the case in the law, it depends. Generally, the answer to this question is “no,” although a corporate officer may be liable for egregious behavior. The fired employee would most likely sue the corporate officer for intentionally interfering with the employee’s contract or advantageous business relationship with the corporation. This article focuses on a corporate officer’s personal tort liability for interference with an employee’s employment and does not concern the personal liability of officers under state or federal anti-discrimination statutes. An employee of a corporation cannot bring a claim against the corporation itself for interference with contract. This is because the corporation was a party to the agreement and cannot be guilty of interference with its own contract. The question is whether the terminated employee can sue officers of the corporation individually where a suit against the corporate entity would be barred. There are a number of obstacles to such a claim. First, an employee suing a corporate officer must satisfy a more demanding test than is applied to claims for tortuous interference arising outside the employment context. To state a claim for the tort of intentional interference with contractual or advantageous business relations, a plaintiff usually must allege: (1) that he or she had a contract or an advantageous business relationship with a third party; (2) the defendant knowingly induced a breaking of the contract or relationship; (3) the defendant’s interference with the contract or business relationship, in addition to being intentional, was improper in motive or means; and (4) the plaintiff was harmed by the defendant’s actions. Such a claim is usually made by one party to a contract against a third party who induced the other contracting party to breach the contract or terminate the business relationship. Where an employee is suing a corporate official acting within the scope of his corporate responsibilities, however, the employee has a heightened burden of showing that the improper motive or means constituted “actual malice,” that is, a spiteful, malignant purpose, unrelated to the legitimate corporate interest. The fact that the defendant officer acts for personal gain, or dislike of the plaintiff is not sufficient. Proof of actual malice is part of the plaintiff employee’s case, not a defense as to which the defendant officer has the burden of proof. The actual malice standard reflects the privileged nature of a corporate officer’s conduct within the scope of his or her duties. A corporate officer is generally privileged to interfere with contracts between the corporation and a third party because a corporate officer’s freedom of action, directed toward legitimate corporate purposes, should not be curtailed by fear of personal liability. Second, even if the actual malice standard were satisfied, an individual corporate officer may be so closely associated with the corporation that the corporation’s contract is properly regarded as the officer’s own contract. In such a case, the plaintiff’s claim will fail because the officer cannot be guilty of interference with his or her own contract. There is, however, no per se rule that a corporate officer or employee can never be a third party vis-à-vis a contract between his employer and another employee. Whether the officer is too closely associated with the corporation will be decided on the facts of each case. Ultimately, a corporate officer’s tort liability for causing the corporation to terminate an employee is a matter of common sense. So long as the officer is acting in good faith, for the good of the corporation, there is no liability. Where, however, the officer acts with an improper ulterior motive to harm the employee, the employee may have a claim. Can a Motorist be Held Liable for Negligently Signaling a Pedestrian That it is Safe to Cross the Road? From kindergarten onward, we are taught to share, be polite and take turns. As adult drivers, we naturally apply these lessons by stopping and signaling another driver or a pedestrian to enter or cross the street. However, this common courtesy has the potential to render you liable for damages if the person signaled is involved in an accident. Consider, for example, a four lane road with two lanes of traffic moving in each direction and driveways entering from the side. Suppose that you are driving in the right hand lane moving north. You see a pedestrian attempting to cross the road from the sidewalk on you right, stop you car and wave to the pedestrian, motioning her to cross in front of your vehicle. The pedestrian crosses your lane of traffic but is then hit by a car traveling in the same direction as yours in the lane immediately to your left. The pedestrian later sues you, alleging that your negligence in signaling her to cross without verifying that the left hand lane was clear helped cause the accident. Are you liable? “Of course not,” you say. “My signal only meant that it was safe to cross my lane of traffic, not that the entire highway was safe.” You also note that the pedestrian was an adult, not a child to whom you might owe a greater obligation. The Massachusetts courts, however, have rejected these defenses. While age is a factor to be considered, an adult is not necessarily barred from recovering damages. Gennelly v. Leslie, 17 Mass. L. Rptr. 120, 2003 WL 23016092, *1-2 (Mass. Super. 11/24/03). Nor is a signal to cross always to be interpreted as saying only “I won’t hit you.” A court will consider the particular nature of the signal and the circumstances in which it was given. Woods v. O’Neil, 54 Mass. App. Ct. 768, 774 (2002). Whether a defendant’s signal to cross was negligent will usually be a fact question to be decided by the jury. Id. The liability of a driver who signals others into traffic depends on a number of factors, including, but not limited to: the age of the person signaled; whether the signaling driver was positioned so as to block the signaled person’s view of the road; the nature of the signal given; and whether the signaled person relied on the signal by crossing immediately. Woods, 54 Mass. App. Ct. at 775. Also important is whether that reliance was reasonable. For example, the signaled person could not reasonably interpret the signal as indicating that the entire road was clear to cross if the signaling driver was not in a position from which he could have seen all parts of the road. A negligently given signal is most likely to lead to liability where the signaling driver had a better view of the road than the signaled person. Courts imposing liability on drivers for negligently given signals often base their decisions on the general rule that one who voluntarily renders a service to another which he should know is necessary to protect that other person from harm (in this case the service of checking the safety of the road and advising the other of when it is safe to cross) can be held liable for negligence in rendering that service if the other person is injured. Does this mean you should never signal anyone to cross or enter a road in front of your vehicle? Of course not. In many situations such cooperation is essential if traffic is to continue moving at all. But by signaling you take on a responsibility to the signaled person. You should be aware of other traffic on the road that might pose a threat to the person you intend to signal before or after they have passed in front of your car. That person’s life may be in your hands.